Shake well before use. Apply liberally and evenly to face, neck, and décolleté. 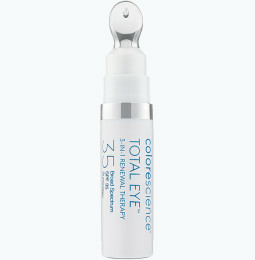 Provides environmental protection against UVA/UVB, pollution, blue light, and infrared radiation. 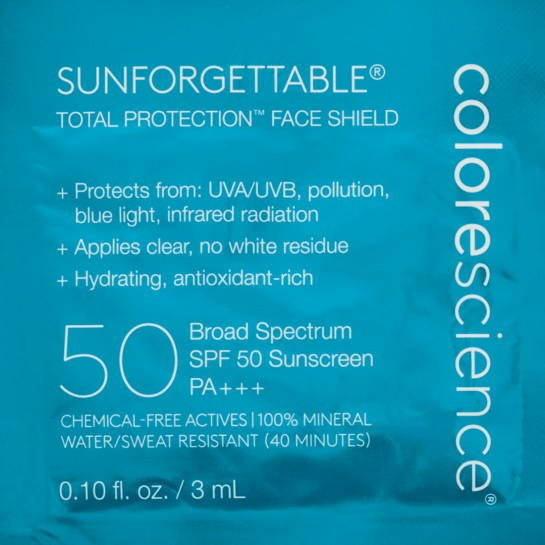 Be the first to write a review of Sunforgettable Total Protection Face Shield SPF 50 Foil Sample. 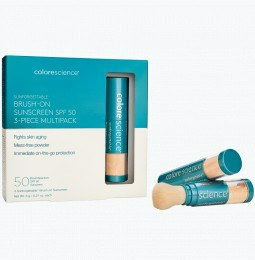 Your opinion is important to us and to Colorescience users. We want customers to get the information they need to make smart buying choices, and we'd love to have your help doing that. As a Colorescience customer, you can submit written reviews. We encourage you to share your opinions, both favorable and unfavorable. We do not remove reviews because they are critical. However, we do ask that you follow our reviews guidelines below. Reviews not meeting these guidelines may not be approved. We may edit reviews for spelling, grammar, or content, while doing our best to maintain the intent of the author. Our content edits are intended to remove claims that may be barred under federal regulations and to clarify inaccuracies (for example, mentioning an incorrect ingredient). We will not change the star rating on reviews. 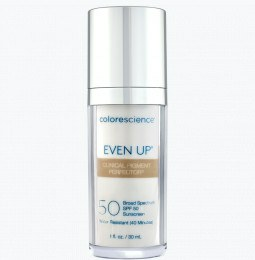 Reviews by customers who have not purchased from Colorescience.com and/or who have not used the product. Content that is excessively unclear or obviously inaccurate. If you have safety concerns about the product you are reviewing please discontinue use, talk to your physician, and contact us directly. Make sure to include all information about the details of your use of the product. If you have a questions or concerns about this reviews policy, please contact us.